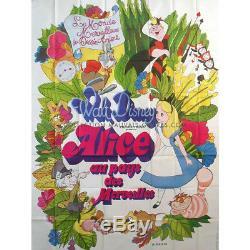 ALICE IN WONDERLAND Original French Billboard Poster - R1970 - Walt Disney RARE! ALICE IN WONDERLAND French N01 Movie Poster - Directed by Walt Disney with Ed Wynn. Condition: Very good to Excellent (C7). NOTE : There is a Watermark on the picture, "mauvais-genres. Com" is not written on the product. THIS IS NOT A DVD! 1 or 20 items, same price! Request for the total before paying. All the packages are insured and we provide tracking. Please read carefully the description of the product, the condition is clearly mentionned. Mauvais-Genres-com / Vintage Cinema Collection is a Online store based in France specialized in movie memorabilia, most of it related to "Genre" Movies : original pressbooks and heralds, signed photos and movie still, theatre-used movie posters, rare storyboards and great artworks, always in decent condition. The item "ALICE IN WONDERLAND Original French Billboard Poster R1970 Walt Disney RARE" is in sale since Friday, March 9, 2018. This item is in the category "Entertainment Memorabilia\Movie Memorabilia\Posters\Originals-International\1970-79". The seller is "vintagecinemacollection" and is located in Les Angles. This item can be shipped worldwide.